Our range of lightweight and waterproof jackets are great for protecting you from the rain. Offering great value for money, these rain jackets will keep you warm and dry during any outdoor activities. Available in various colours and sizes, rain jackets from System Hygiene are tear resistant and exceed waterproof standards to bring you the best protection. 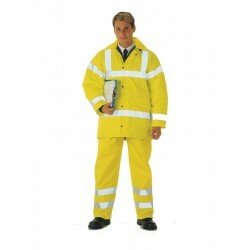 We also offer high visibility options depending on your requirements, as well as bodywarmers that are both stylish and practical. The products available here are a popular choice with workers up and down the country, sheltering them from spring showers and torrential downpours.